Kevin: Kevin again at rvingplanet.com. We’re here at the RV show in Hershey, Pennsylvania. I know we’ve talked a little bit about this in some other recent videos last month, but I also wanted to bring to you technorv.com. We’ve been walking around the show, finding some really interesting products, fun things to bring you guys, and we came across these guys. Eric’s going to tell us about some fun technology-related RVing things that he has. Eric: Yeah, absolutely. Thank you. Kevin: What do you have, Eric? 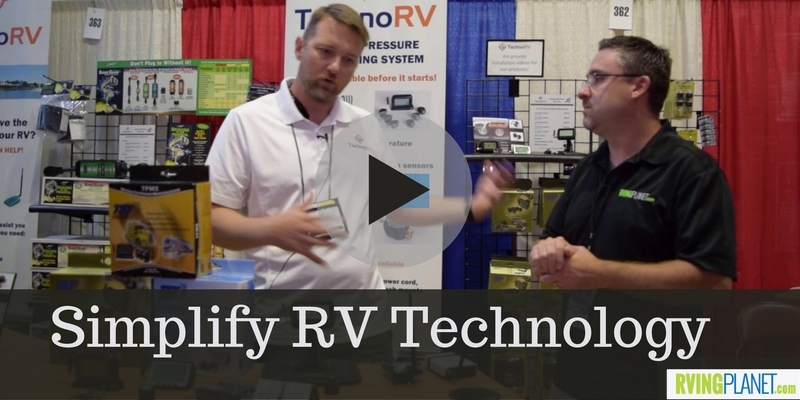 Eric: TechnoRV specializes in technology for RVs and some of the products are safety-related items and some of them are convenience related. This one right here is a tire-pressure monitoring system. Everything’s riding on your tires and having the ability to monitor the PSI and the temperature of your tires is extremely important to prevent tire failure, things to come. If you have PSI issues, temperatures issues, then tire failure is probably imminent. The TST tire pressure monitoring system is the system that we feature and we’re real proud of them. They use high-quality circuitry in their monitors. Basically, it’s real simple. You have a senor that you put onto your valve stem and this pings forward and gives the information into the monitor that’ll be in the RV. If you have PSI or temperature issues, it’ll alarm you. For the end-user, that’s kind of it. You install it, then you just kind of forget about it. If something happens, it’ll let you know. It’s a safety issue. Kind of a convenience technology piece that we have here is the RVer’s go into RV parks. A lot of them will have WiFi available, but it’s kind of hard and difficult to connect to those from time to time, so basically that’s because we’re trying to connect with the internal WiFi adapters in, say our iPads or iPhones or whatever, androids, and they’re just too weak to pick up a connection from, say 100, 200 yards away. Basically, a WiFi booster is basically adding more power on the transmission side that transmits your signal out and will receive power through an antennae. Instead of using your internal adapter in, say your phones or your iPads or whatever, you’re now using this device. Basically, the end result is, often times, we’ll go from an unusable signal to now all the sudden we’re able to surf online, check emails, and different things like that. Pretty slick item. Both of these items are very popular for RVer’s. Again, from a safety issue, this is a must, and from a convenience issue, everybody wants to stay connected on the road. Kevin: I know that an RV client recently, we just did an article on maintenance, getting ready for fall and kind of getting … I think we used a picture of a blowout. This, obviously, would help solve that problem. I mean not solve it, but does alert you earlier to any types of issues with your tires to avert that problem. Eric: There’s usually indicators that proceed a blowout. This is going to identify those for you and alarm you. It’s just something you don’t have to think about. We hear all the horror stories. People who come to our booth at shows or give us a phone call. We’ll hear those stories about people having blowouts. These RVs are so big and heavy, a lot of times people don’t even know what’s going on. Maybe they’re 40,000 pounds going down the road, towing another vehicle, they might have a blowout on what they’re towing and don’t even know it until somebody pulls up next to them and notifies them. The TST tire pressure monitoring system kind of resolves all that for you and it’s an investment in safety. Kevin: This, obviously, would help solve that problem. I mean not solve it, but does alert you earlier to any types of issues with your tires to avert that problem. Kevin: Anybody that’s ever been RVing or camping and tried to get to the WiFi signal … I have a unit like this in my travel trailer and it is a must-have. Kevin: Because that’s where everybody wants to be so they can get the WiFi. Eric: Yeah. These are, in general terms, about 10 to 15 times more powerful than your internal WiFi adapter, so if you’re at a park and you’re kind of getting a signal, but you’re struggling, things are buffering to even load up to standard sites, a lot of times that’s an issue that’s the end-user responsibility, because they just think they can do that with their internal adapter and they just can’t. Most of the manufacturers aren’t going to design a phone or an iPad with an internal adapter that can connect something 200 yards away, like what’s the point of that? But RVer’s, it’s extremely important for us, because we’re faced with that all the time. Kevin: Right. Something that Eric also mentioned earlier, before we even got started with this video, what I thought was very helpful for RVers like myself and RVers like you guys is not only do they have the products, right? At technorv.com? Kevin: Tell us a little bit about those resources you have available there as well. Eric: With most of our products, including these two products right here, when someone purchases from TechnoRV, we include what’s called our Learning Series and we’ve basically written our own instructions that’s complete with pictures and arrows and a lot of videos of us actually setting the systems up. Because sometimes technology can be difficult for newer or even experienced RVers and so we don’t want to just put this in their hands and have them feeling like they’re just kind of left out there on their own. We provide those additional learning resources for them and then also we’re available for support. People can just call me on the phone once they purchase the product, they need additional support, they call me, and I’ll just walk them through whatever issue they might be having. Eric: It’s kind of our business model. I wish there was more of that kind of customer service out there. We decided when we set up our business model, this is how we’re going to do it. Kevin: We’re grateful for you. Eric: Technorv.com, we got these products, we got electrical management protection systems, RV GPS systems, dash cameras, it’s all technology-type products, and you can get a lot of use out of these products to make your trip safer and more convenient. Kevin: Awesome. Very good. Thanks again, Eric, appreciate it very much. Be sure to check out technorv.com. The link will be in the show notes and we’ll catch you online at rvingplanet.com.